Stockholders in high marginal tax brackets buy securities with low-dividend yield and vice versa. *Lewellen et al. use several alternative methods to calculate the marginal tax rate from data on income. The results are broadly similar, and above we give the results for their "Tax-l" definition. From W. Lewellen, K. L. Stanley, R. C. Lease, and G. C. Schlarbaum, "Some Direct Evidence on the Dividend Clientele Phenomenon," Journal of Finance 33 (December 1978), p. 5.
which the dividend is received while taxes on capital gains are deferred until the year of sale. Nevertheless, dividends in the U.S. economy are substantial. 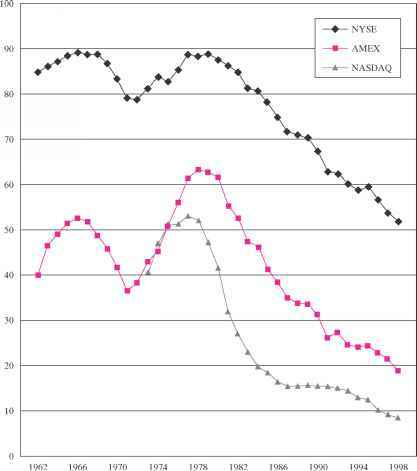 For example, consider Figure 18.7, which shows the ratio of aggregate dividends to aggregate earnings for firms on the New York Stock Exchange (NYSE), the American Stock Exchange (AMEX), and NASDAQ over various time periods. 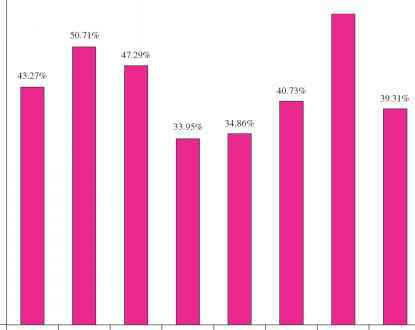 The ratio is approximately 43 percent for the period from 1963 to 1998. This ratio varies from a low of 33.95 percent in the 1973-77 period to a high of 56.86 percent from 1988 to 1992. One might argue that the taxation on dividends is actually minimal, perhaps because dividends are paid primarily to individuals in low tax brackets or because institutions such as pension funds, which pay no taxes, are the primary recipients. However, Peterson, Peterson and Ang32 conducted an in-depth study of dividends for one representative year, 1979. They found that about two-thirds of dividends went to individuals and that the average marginal tax bracket for these individuals was about 40 percent. Thus, we must conclude that large amounts of dividends are paid, even in the presence of substantial taxation. 32P. Peterson, D. Peterson, and J. Ang, "Direct Evidence on the Marginal Rate of Taxation on Dividend Income," Journal of Financial Economics 14 (1985). 33E. F. Fama and K. R. French, "Disappearing Dividends: Changing Firm Characteristics or Lower Propensity to Pay?," Journal of Financial Economics (April 2001). Corporations pay a significant amount of earnings out as dividends. Source: Table 11 of E. F. Fama and K. R. French, "Disappearing Dividends: Changing Firm Characteristics or Lower Propensity to Pay," Journal of Financial Economics (Apr. 2001). listed on the different exchanges. For the most part, firms of this type do not pay dividends. In addition, the authors argue that the percentage of firms of all types paying dividends has declined in recent years. 34J. Lintner, "Distribution and Incomes of Corporations among Dividends, Retained Earnings and Taxes," American Economic Review (May 1956). Source: Figure 5 of E. F. Fama and K. R. French, "Disappearing Dividends: Changing Firm Characteristics or Lower Propensity to Pay," unpublished paper, Graduate School of Business, University of Chicago (March 1999). ratio if it has few positive NPV projects. Second, managers know that only part of any change in earnings is likely to be permanent. Because managers need time to assess the permanence of any earnings rise, dividend changes appear to lag earnings changes by a number of periods. 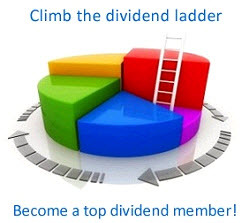 where Div1 and Div0 are dividends in the next year and dividends in the current year, respectively. EPS1 is earnings per share in the next year. The limiting cases occur when s = 1 and s = 0. If s = 1, the actual change in dividends will be equal to the target change in dividends. Here, the full adjustment occurs immediately.